Julie D’Agastino takes lead in her high school production of "Hairspray"
There are times when Julie D’Agastino can barely breathe, but this weekend she'll be singing her heart out. 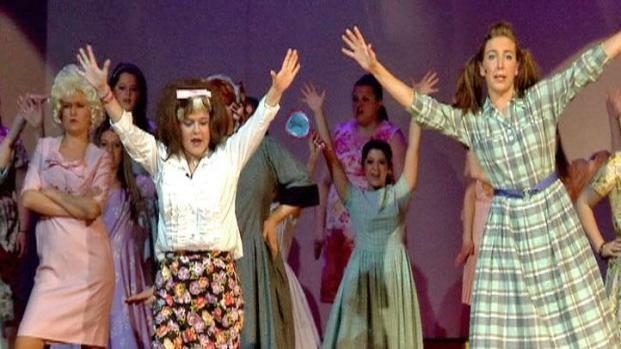 Though stricken with the potentially deadly lung disease cystic fibrosis, the senior at Immaculate Conception High School in Elmhurst is the lead of her school musical "Hairspray." "Even though my breathing may not be the best all the time, I still really, really love to sing," said 18-year-old. Her home is filled with oxygen tanks and intravenous equipment that helps keep her alive while she awaits a lung transplant. At times she can barely breathe, but 18-year-old Julie D'Agastino still made the lead of her high school musical "Hairspray." Her mother, Mary D'Agastino, said that some days her daughter barely has the lung capacity to get off the couch to go to the bathroom. The teen is in and out of the hospital every few months, and when she tried out for the part, she was taking oxygen in the breaks. "She has a wonderful voice, but because of her condition you appreciate it more," said Mary D'Agastino. Julie is performing with her twin Natalie, the two have an amazing bond. "She's a true inspiration to my family and friends," said Natalie D'Agastino, adding that even with all of her sister's difficulties, "she is always wearing a smile."